Home » Make Sure Your Pet is Prepared for a Disaster! 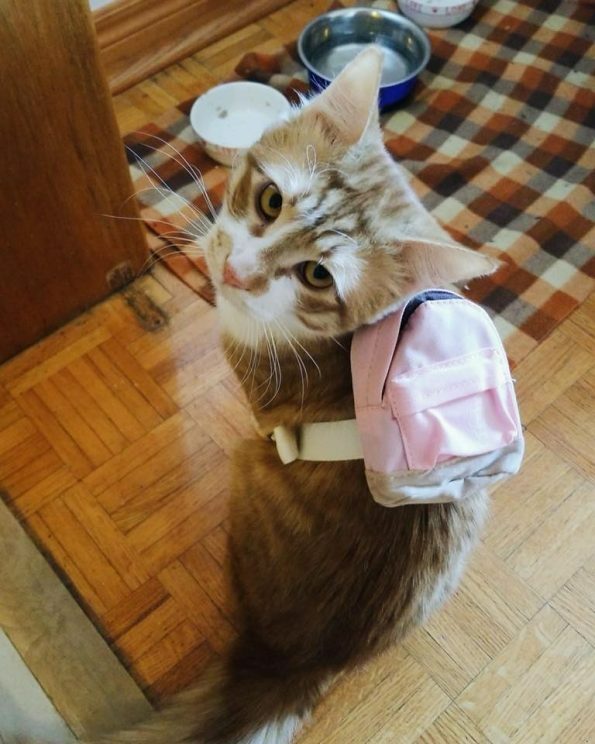 Simba’s ready to evacuate in an emergency…is your pet? September is National Disaster Preparedness Month. An emergency can happen at any time, and in a worst-case scenario you may only have moments to evacuate – or be unable to return home at all. Do you have a plan and an emergency kit for your family, including your pets? Here’s what your pet emergency plan and kit should contain. Schedule a time in your calendar right now when you will gather these items and information – a few hours now could be lifesaving in the future! – Medications and medical records (including vaccinations) *we can email or print an updated vaccination certificate for your kit, just ask! Keep this kit in the same spot as your family emergency survival kit for easy retrieval. Pets need supplies, too. Animals get anxious during emergencies. If possible, keep your pet in a carrying cage with a familiar blanket, so your pet(s) feels as secure as possible. Do not leave your pet alone, with strangers or without a leash at any time. During an emergency, your pet may panic, behave in a distressed manner or even run away and end up lost. Or, because of the distressed state, your pet may bite someone. REMEMBER… during an emergency, you are still responsible for your pet. If safety permits, take your pet with you! Pets should not be left behind during an evacuation, as they may be injured, lost or even killed as a result of the emergency. Remember to take your pet emergency kit with you when you evacuate. – Contact hotels and motels outside your immediate area and check their policy on accepting pets during an emergency. – Ask friends and relatives outside your immediate area if they could shelter your pets in an emergency. – Prepare a list of boarding facilities and veterinarians who could shelter animals in an emergency (include a 24-hour phone number). – Contact local animal shelters and ask if they provide shelter for pets in the event of an emergency. This should only be used as a last resort, as animal shelters have limited resources and will be very busy in an emergency. – Record this information on a sheet and keep it in your pet emergency kit. Review it regularly to ensure the information is accurate. You may not be at home when an evacuation order is issued. In advance of an emergency, ask a trusted neighbour to evacuate your pet if need be, and meet you in a prearranged location. This individual should have a key to your home, know where the pet emergency kit is located, be comfortable with your pet and, most importantly, know where your pet is likely to be. In the days following an evacuation, don’t let your pet go outside unattended. Familiar scents and landmarks may have changed and your pet may get easily confused or lost. If there has been damage to your property, be aware that there could be sharp materials, electrical wires or other hazards in and around you home. Inspect your property carefully before allowing your pet to enter. Remember, the behaviour of your pet may be different after an emergency. Monitor your pet and contact your veterinarian if you are concerned.